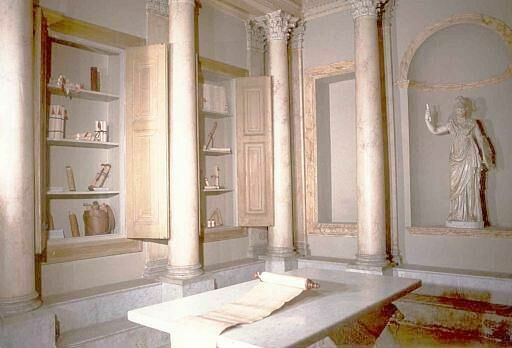 The best-known private library of the Imperial Age is recognised to be the one housed in Villa Adriana in Tivoli. 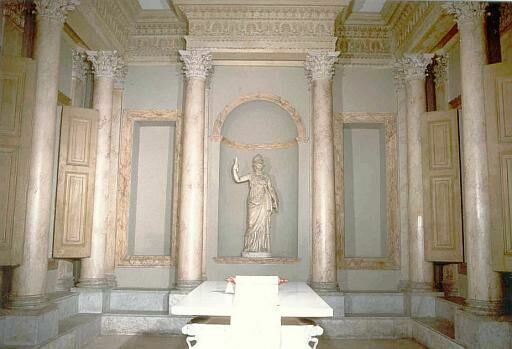 This grand hall, provided with an apsidal niche at the far end, inspired the reconstruction of a Roman Library in the Museo della Civiltà Romana (Museum of Roman Civilization); in addition to accomodating a statue of Minerva in the absidal niche, in other niches are housed reproductions of objects used in writing and in reading in the Roman world, reconstructed both technically and scientifically at the Villa d'Este Laboratory. Among them we find: papyrus volumes with stick, palette of the scribe, Greek and Latin papyri, fascicles of volumina (volumes) bound with red strips, linen books, dealbatea tablets, tabulae cerata with stylus, plumbea charta, capsae and parchments.